Can you give a description of what someone would experience visiting your exhibition, Home Sweet Home? Someone who is coming to see Home Sweet Home basically walks into a sketchy house. It’s pretty barren, you can see the wear and tear of the years of neglect. As you enter the house, you come around the corner to my living quarters. You’ll see a full set up— couch, TV, closet space, small kitchenette, and cases of water. Because I am from Flint, my goal was to give viewers at ArtPrize a real life glimpse into the day to day life of someone living in Flint, Michigan who does not have access to clean water. I wanted to show the things that they would have to do to complete the basic tasks that we take advantage of, things like washing dishes or washing your hands. You mentioned that you are from Flint, what was your personal experience with the Flint Water Crisis and how that was worked into your piece? I was actually here [in Grand Rapids] at school when everything broke in the news. So at first I saw it from an outside perspective, my parents, my grandparents, my aunts and uncles, they were all at home. I was getting Facebook shares and articles before the actual news break in 2014 about something going on with the water. Growing up, before that experience, we never really cared about the Flint River. We never thought about it as a water source that we could swim in. I remember we would do these science experiments in elementary school to test the water for certain insects or creatures that should be at certain water sources to let us know it was a healthy water source. And the Flint River never showed any signs of this, so we all grew up knowing that fundamentally the Flint River was a nasty body of water. We knew it was used by corporations as a dumping site. So when 2014 came around and the city manager went ahead and made this decision to switch to sourcing from the Flint River, it felt like a huge slap in the face. So being here in Grand Rapids and seeing everything happen back home, I was feeling like I couldn’t really do anything for my mom or my cousins or any of my family. I asked myself, “How can I be a voice for those at home crying out and saying there’s a problem when no one is paying attention?” Out of my own frustration, first I tried the whole facebook post thing, created a go-fund-me, all that. But living here, I realized that if the problem isn’t reaching and affecting other people, they probably aren’t going to care. Unfortunately we all have that in some fashion, whether it be domestic violence or sexual abuse— if it’s not directly affecting us, we probably have a lower level of care. 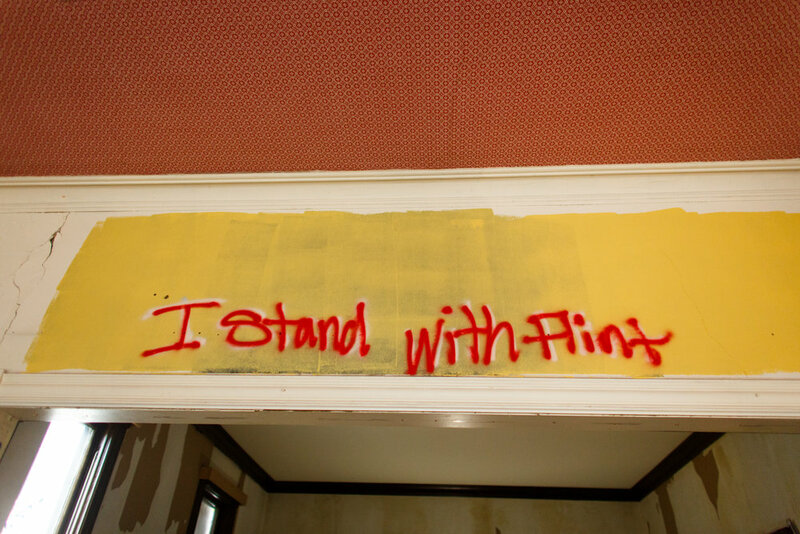 So I wanted to make the people of West Michigan and anyone coming to ArtPrize understand exactly how a resident of Flint is feeling by entering this home and seeing firsthand everything someone would have to do to survive. What were some of the reactions you witnessed from visitors coming through the space? It was a mixed bag. My first viewer was actually from out of the country, from Sweden I believe. And we had an awesome talk about socialism! A lot of reactions were based in ignorance. Hearing comments like, “Oh that’s still going on?” was one of the biggest replies. Which was crazy to me! Because this isn’t outside of the country or across the ocean, this is happening in the very state we live in! There are so many things that are happening right under our noses, but we live in our own comfortable bubble that we don’t want to pop. This bubble is filled with all of our personal idiosyncrasies and all the things that we cherish, but sometimes those things blind us from seeing what is a reality for someone else. There was a lot of rhetoric coming from people who wanted to do something to help. But it was rare that I’d see someone walk out the door ready to fight the fight. It felt more like people were in the face of the issue and giving moral support right here, and that was their good badge for the day. Towards the tail end, after the apology was made to Rumsey Street from ArtPrize, we had a lot more foot traffic and a lot more people that were into the actual issues and more people wanting to talk about social justice. So yeah, it was a mixed bag. The themes within your piece are definitely pretty charged in today’s political climate. How do you think that having conversations around these topics through an art installation was able to spark new understanding with visitors? Where maybe reading about the same things in a news article may have fallen short? I think it’s the real life application of people seeing me make ramen noodles out of my coffee pot or taking bird baths in the corner with a water bottle! I think that made it real for people. I know some things have changed a little bit in Flint, but there are still families living in pretty rough conditions. Making it real for people gave them the first had look at what my family went through. The documentary portion of Home Sweet Home was a series of interviews with family and friends that I conducted while I visited home for the first time in five years. Just checking in and catching up, all anyone could talk about was the water issue. So we filmed it. It gave them the opportunity to speak out about how it happened, how it’s affecting them, and what things need to be known to the rest of the country. What would you say the importance was in having your work hosted at Rumsey Street alongside the Cultura Collective as opposed to an institution like a gallery or an art museum? I originally wanted to show by myself, but I couldn’t find a connecting venue until a resident on the Southwest side reached out to me and introduced me to Steffanie Rosalez. Steffanie shared with me her own mission of what she was trying to portray, along with some of the stories of the Southwest side. She shared with me stories of the development there, how it will affect the residents of the neighborhood, and how a lot of their voices have been muted to the city. It really aligned with what was happening in my own home town. So we made that connection over wanting to tell all these stories. Do you have any creative projects in the works or ideas you’re sitting on? I’ve created this cartoon about this character named Ready.And.Talented, his acronym is R.A.T. It underlines how I felt in the scholastic art community. I transferred to GVSU with credits that would have made me a junior in my art program, but all my credits were denied and I had to start from scratch. It was the worst feeling in the world, being forced back through fundamental classes that I’ve already taken. I spent about a year and a half there before eventually telling myself that enough was enough, this program can not validate the talents that I have. I’ve been drawing since I was seven years old and I’ve been in tune with learning my craft ever since then. To get to this point in my life where I’m going to a university to get this accreditation, I found out that a university can not validate me so I dropped out. So I go by the ArtSchool Dropout, and my own purpose, is to remind people that only you can validate you. Other than that, I just want to paint Grand Rapids. I’m looking to get into murals, I have a pending project for a wall over on Clancy Street. So I want to become a mural artist and just paint!